Mālama Learning Center provides content and support to teachers in Leeward/West O‘ahu whose students conduct projects that study sustainability using cultural practices in today’s context. Projects culminate at a hands-on fair where students share their acquired knowledge. 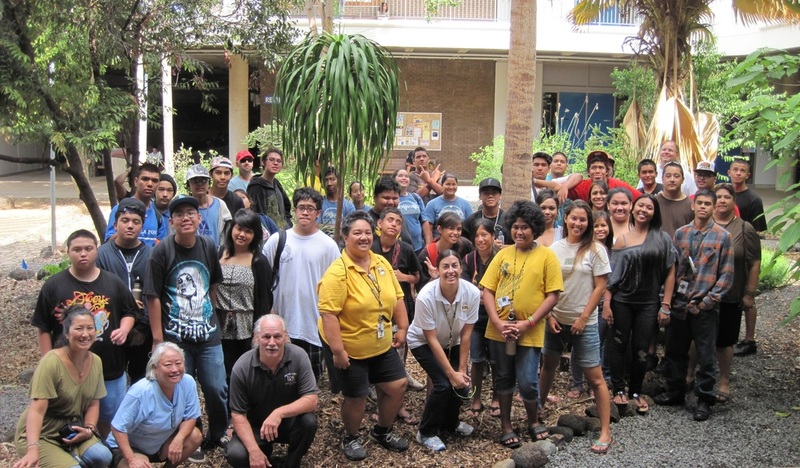 With the support of a grant from the Walmart Foundation Hawai‘i State Giving Council, we were able to help Leeward/West O‘ahu schools start sustainability projects for the 2011-2012 school year. In total, three aquaponics (aquaculture + hydroponics) systems and three native plant nurseries, each different depending on the schools’ needs and circumstances were created! It was so much fun working work with Kapolei High School, Wai‘anae High School, Nānākuli High School, Pearl City High School, and Leeward Community College in this program. The teachers went on site visits and worked hard to put all the pieces together with our educators’ and consultants’ help. These projects, under the Hawai‘i Green Collar Institute, provided and will continue to provide students with hands-on learning opportunities to study math, science, and language arts, and learn about food sustainability and conservation as well as jobs in those fields. Some schools plan to study the business of selling fish and produce from their aquaponics systems to local farmers markets and all schools will be propagating native plants from their nurseries for community restoration projects. In November, 2011, all schools gathered together for a hō'ike at Leeward Community College to share their progress and what they learned.